Having wrapped up the two “megatwin” drawings thoughts turn immediately to what’s going to follow on behind them. As methodical as one might wish to be it’s not always a simple case of reaching over to shelf and picking up the next sheet in the pile and cleaning off the business end of the biro. 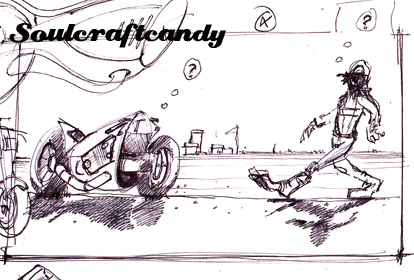 Not being in a position to work on the drawings every day means that the work flow can be a bit erratic at times. As much as one would like to have a selection of different pictures in various states of readiness to work on it don’t always happen like that. 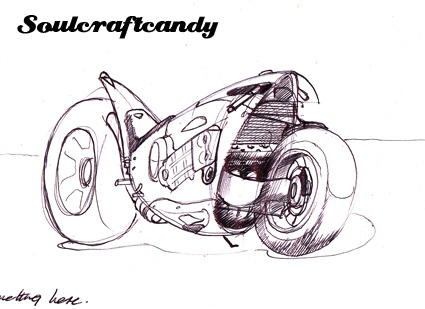 Gaps appear in the chain, as it were, when only doodles and quick sketches lie on top of the pile. At these times I reach for said sketch pile and skim through them looking for any likely candidates for refinement. My noodling sessions, coffee powered periods of ploughing through the image archive, bike mags and various web sites with a pen in one hand and a pad to hand always throw up a rich crop of little ideas. Now it’s simply a case of working a few of them up to a point where a more finished idea emerges. The sketches here show that kind of process in loose form, from initial doodle to something I’ll transpose onto Bristol Board for inking in. It may very well end up as two versions, one with the question mark thought bubbles and one without. easy enough to do but there’s a good chance one may end up getting some paint thrown at it. The form of the bike may lend itself very well to that. Also, the detail on the horizon line in the initial sketch has been left off the latest version but may very well re-appear later on. 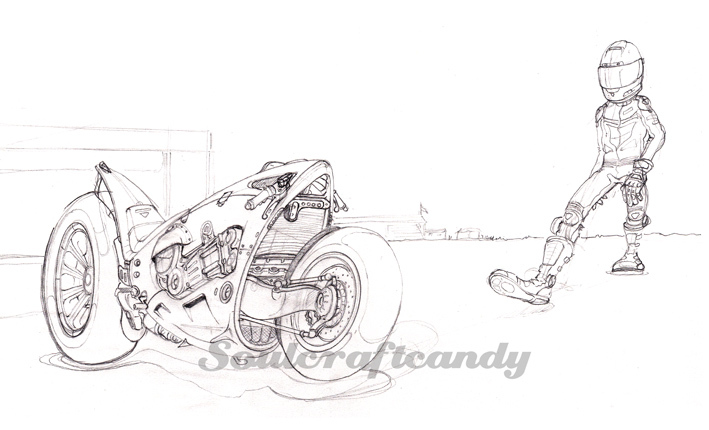 This entry was posted in Bike drawing, Biro drawing, Doodles, Drawing, Inspirations, Motorcycle drawings, Pencil by Soulcraftcandyman. Bookmark the permalink.